East Worthing and Shoreham MP Tim Loughton raising questions about the inquests into the deaths of 11 men at the Shoreham Airshow in 2015 with Theresa May at Prime Minister's Questions (photo from Parliament.tv). Families of the 11 men who died at the Shoreham Airshow crash have been denied legal aid funding, Prime Minister Theresa May was told today (Wednesday November 1). Tim Loughton, East Worthing and Shoreham MP, commented that more than two years on no decision has been taken on criminal charges, while a coroner’s inquest had been delayed until November 2018. He told Mrs May during Prime Minister’s Questions that the families of the victims have just had their application for exceptional case funding rejected by the legal aid agency. He said: “They will likely be the only persons at the inquest not legally represented. 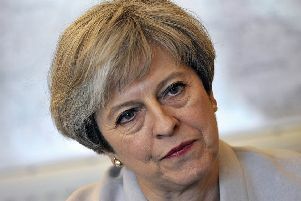 Mrs May responded: “I can fully understand the concerns of the families in relation to this. He talks about the timetable for decisions being taken. “The Department for Transport has accepted the Air Accidents Investigation Branch’s recommendations for an independent review, and they are working with the Air Accidents Investigation Branch to determine the exact scope of the review, and the Civil Aviation Authority has accepted all recommendations.